One of the sad facts about the many deployments our service men and women are called upon to do is the possibility of traumatic after-effects. Yes, that’s been given a name: PTSD–Post Traumatic Stress Disorder. But, for those who have a loved one who has been diagnosed with PTSD, the label doesn’t necessarily help. What might help, however, are books like Welby O’Brien’s Love Our Vets: Restoring Hope for Families of Veterans with PTSD. This is not a psychology book. 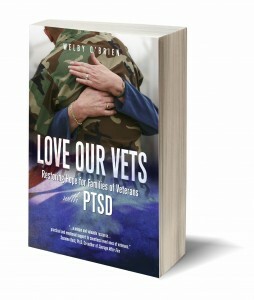 Written in an easy-to-read question and answer format, Love Our Vets helps the average person understand some of what goes on in a PTSD victim’s mind and heart. The book includes many real-life scenarios from different families which help shed light on this difficult disorder. Let me share with you one of my favorite quotes from the book. Do not try to fix…just love. Be with. Fixing says, ‘You are not okay until you are better…you have to change to be good enough.’ We are not told to fix each other’s problems, but to bear each other’s burdens. That is compassion. That compassion heals. Scientists and psychologists are discovering that healing the actual physical brain happens with love and ‘being with.’ The body chemistry changes when it is being loved. Suffering will happen, and it is not the worst thing. Suffering alone is the worst thing. God never intended us to be alone. The book is broken up into three main sections: REAFFIRM–Our Questions, REPLENISH–Our Needs, and REFLECT–Our Wisdom. I would heartily recommend Love Our Vets! If you, or someone you know, has a loved one with PTSD, please consider picking up a copy. And, if you’d like to learn more, you can visit Welby O’Brien’s website at LoveOurVets.org.